As a Product Manager of a team with more than one distinct deliverable, I want to understand and compare the current status and the recent trends in the scope of work and completed work for all deliverables the team is responsible for, so that I can discuss the team's status and people needs with leadership. As a Product Manager of a team with more than one distinct deliverable, I want to understand the relative scope of work of the different deliverables, so that I can help the team prioritize their work or adjust my criteria for triaging new work. 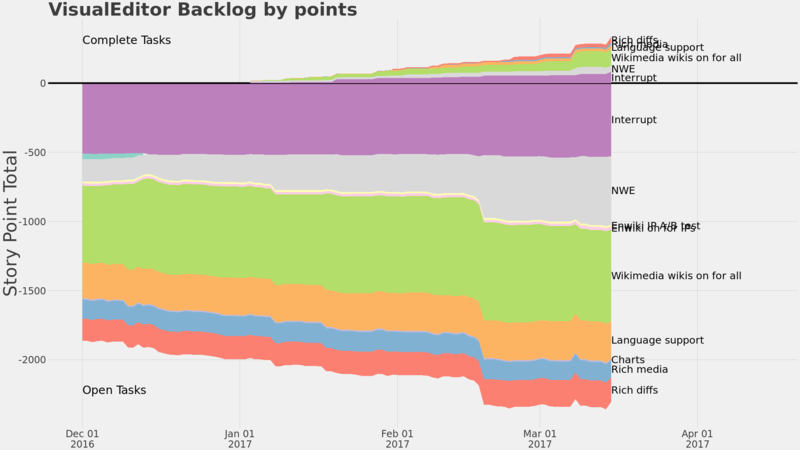 As a Product Manager, I want to compare a team's cumulative progress over a time period such as a quarter to the team's total backlog, so that I can estimate how many months or years of work the current backlog represents, so that I can triage and forecast more accurately. We've been experimenting with the sample solution shown, where (open) scope of work is shown below the X axis and completed work is shown above the X axis. We show only work completed since the last quarter start, or else the chart would be unreadable for long-established teams. This chart has a tremendous amount of information, and in theory addresses many more use cases. However, they are not listed here because it doesn't address them very well; e.g., velocity charts are much simpler and work much better for velocity-related inquiries.